The burden of frailty in Canada is steadily growing. Today over one million Canadians – are medically frail. And in 10 years, well over two million Canadians may be living with frailty. Frailty is also linked to higher consumption of healthcare resources. 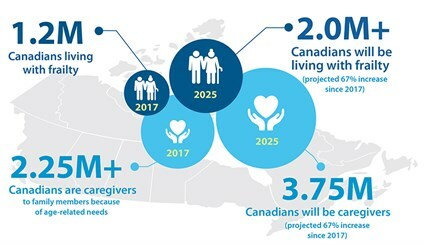 Of the $220 billion spent on healthcare annually in Canada (11% of GDP), 46% is spent on people over 65 years old, although they are only 16% of the population. Canadian seniors account for 40% of acute care services and occupy 85% of acute care beds. Older Canadians living with frailty are over-represented in all parts of the healthcare system: primary care, community and residential care, acute care and end-of-life care. This growing population is both under-recognized and under-served, challenging the healthcare system to improve the quality and quantity of care delivered. Currently, we have little evidence to guide the care of older adult living with frailty. We don’t know if current therapies are beneficial or cause harm, are cost-effective or waste scarce healthcare resources. Healthcare systems are organized to manage illness based on single body systems and diseases, not the complex multi-system problems of those living with frailty. Frailty is poorly understood, pervasively under-recognized, and under-appreciated by healthcare professionals and the public. Few healthcare professionals have expertise in caring for the frail elderly. Poor system integration causes poor outcomes for older adults living with frailty.